Thanks for visiting my new blog. I hope this will not be your first and last visit. Please do come back. I love to exchange links with you. Just leave your name, url and blog title in the comment section so that I can include you in my blogroll. Don’t forget to add me too. I will be your frequent visitor. If you have faved me at technorati, please let me know so that i can fave you back too. Wesley Snipes was sentenced by a florida judge to 3 years in prison because he did not file his income tax from 1999 to 2001. He was acquitted on five other charges including felony, tax fraud and conspiracy otherwise that will be another 13 years in prison. It has to be determined yet as to how much he owes the IRS, plus interest and penalties. He made at least $13.8 million for those 3 years, making him owe them at least $2.7 million in back taxes. Do you think they could handle “blade” in prison? Arby’s is buying Wendy’s in an all stock deal worth $2.34 billion.. Arby’s is a fast food chain known for selling roast beef and chicken sandwiches, chicken strips, potato cakes and their famous curly fries. They also have deli style sandwiches and wraps. Wendy’s on the other hand serves primarily hamburgers with square patties, chicken sandwiches, french fries, beverages and salads. When the whole deal will be completed, the combined number of restaurants will be around 10,000 making it the nation’s third largest fast food restaurant. There will be a name change but it wendy’s name will still be included. It was in the news last night that costco and sams warehouse club are limiting the number of bags of rice customers can purchase. They did not say that we have a shortage, all they are saying it is because of the "recent supply and demand trends" and some customers are stocking up in anticipation of the increase in prices. The limitations are more on the imported rice like jasmine, basmati and long grain rice. There were even notices on their shelves to let the customers know that they cannot purchase so many bags of rice. Hope this is just temporary and we want to see more of our favorite jasmine rice on the shelves. I am so happy that we are now with verizon fios because they offer abs-cbn’s the Filipino channel in their package. What I like is that you don’t have to install a dish outside your house or on the roof to be able to get the Filipino channel. It is all abs-cbn shows. I’m not complaining, it’s better than nothing. It’s like subscribing to hbo. We always make it a point to watch the news at night to keep us updated of what is happening in the Philippines. For myself, I like the showbiz portion and the entertainment shows. My daughter is learning some tagalog words because of watching TFC. Although I still frequently browse inquirer and philstar websites but it’s just different when you see the news on tv. It is almost a month now since gabby concepcion arrived in manila after 13 years of living a private life in the united states. When he left, there were some profession and personal controversies left also. He was involved in the metro manila film fest fiasco which caused the drift between him and his manager lolit solis. It has been settled they said before he came home. The good looks are still there, screaming fans everywhere and creating a stampede when he goes for tv appearances. That is not a surprise, he is gabo, the regal baby with that close-up smile. It will be expected that he will be in the Philippines for at least 2 years being that he signed a 2 year contract with abs-cbn. He recently purchased a condominium in greenhills where he and his family will live as they come to join him soon. Also, one of the reasons why he decided to come home because he wants to spend time with his father, Rolly Concepcion, who is suffering from heart ailment. He wants to start a new life, get closure of whatever was left hanging and unanswered when he went to the u.s.. It is also time to start a relationship with his daughters KC (by Sharon cuneta) and Gabrielle “garie” (by Grace Ibuna). Cloie his daughter by Jenny Syquia is not based in the Philippines. He recently got married to Genevieve Yatco who is based in sf,ca and they have a 2 month old daughter named Samantha. So there it is, Gabo is back in the limelight. In a few months from now, expect a blockbuster movie starring Gabby Concepcion. I saw ex-president Corazon Aquino on TV yesterday, a month after her family announced that she has cancer of the colon. Her daughter Kris Aquino said that her mother has been responding very well to the chemotheraphy. It was her decision to be on TV and grab the chance of thanking everybody for the overflowing support, prayers, emails, letters, cards that they have been receiving from people they know and they don’t know. The interview was during the first birthday of her grandson, Kris Aquino’s second child, Baby James. Cory Aquino said she does not feel any pain but she just gets tired easily. Hope with all the love, support and prayers from her friends and families, she will get better and better everyday. The Pope's visit to the U.S.
Pope Benedict XVI has just finished his 6 day visit in the u.s. He was in washington, dc for the 3 days and another 3 days in new york. He made history when he visited a jewish synagogue in new york. 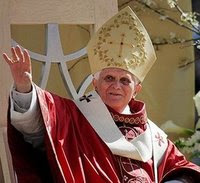 Pope Benedict XVI also visited st. patrick’s cathedral, st. joseph’s church, held mass at the yankee stadium with close to 60,000 people, a motorcode on 5th avenue and a stopover at ground zero. He is well-loved, people are teary eyed just seeing the pope face to face. Some are very lucky to be able to kiss and shake his hands. Security was tight for the duration of his visit. He was securely transported in his popemobile, a very unique car by mercedez with a 6 foot bullet proof glass enclosure at the back where the pope could sit comfortably while waiving at the crowd. This popemobile was shipped to the u.s. from rome two weeks before the pope’s arrival. The pope left last night in his private plane before a crowd of 4000 at the airport’s hangar bidding goodbye to him. Thanks for the visit Pope Benedict XVI. i have chosen a 3 colum simple template for my blog. thanks to : template panic. the website has all the instructions of how to download the file. it was easy and in 5 minutes i have a new template. woohoo!!! This blog is a baby of the mother blog. I joined the bandwagon now and I’m having fun meeting new friends on the blogosphere. At first, I was hesitant because nobody knows me and it’s like everybody knows each other already but I just started communicating and exchanging messages through my tagboard and everything is history. I am still learning the ins and outs of blogging but everybody is so helpful. I hope I will see your faces/names on my new blog. See you around guys.